Guests on Royal Caribbean's Anthem of the Seas can reserve their own special spot on the pool deck that will be just for them throughout the day in a prime spot. The sun beds are located near North Star and overlook the pool deck in the North Star Private Lounge area on deck 15. The sun beds offer not just a private chair for you, but they are furnished with added cushions and pillows and come with a bottle of Moët Chandon Ice Imperial. The cost is $150 per sun bed (plus 18% gratuity), and offers access to it throughout the day. These sun beds are available for all guests to reserve once onboard the ship. Do you want to reserve one of these chairs? Tell us what you think about this option in the comments! Many people choose to celebrate the holidays on a Royal Caribbean cruise, and we have a look at some of the Christmas decorations onboard Anthem of the Seas. Royal Caribbean decorates its ships quite nicely for the holidays, and each ship has a different look and feel for this special time of the year. Special thanks to Christie McLarty for providing these photos. Royal Caribbean's North Star observational pod on its Quantum class ships has made it into the Guinness Book of World Records. North Star is available on three Royal Caribbean ships Quantum of the Seas from Beijing (Tianjin), China and Ovation of the Seas from Shanghai (Baoshan), China; Sydney, Australia; and Singapore. The third, Anthem of the Seas, cruises from Cape Liberty Cruise Port in New York Harbor to Bermuda, The Bahamas and the Caribbean. 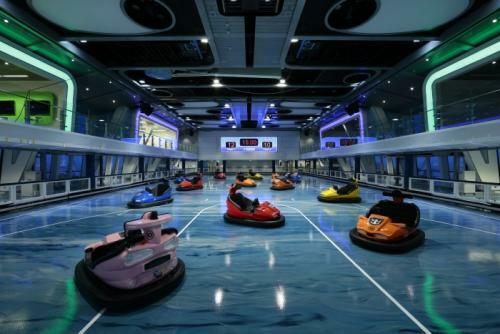 Royal Caribbean is adding additional time for guests to enjoy two of the premier attractions on Anthem of the Seas. In an effort to enhance the overall guest experience, Royal Caribbean is adding support staff onboard to accommodate expanded hours of operation at Ripcord by iFly and North Star attractions. This will allow more guests to experience these popular attractions than ever before. The expanded hours for these attractions will be in place for sailings beginning November 27, 2016. Royal Caribbean is also adding more convenient line-up of show times that complement the evening dining options. For guests in the early dinner seating at 6:00pm, their evening show will be at 8:30pm. For guests in the late dinner seating (8:30pm), their show time will be at 10:30pm. The additional hours are part of the changes Royal Caribbean is making to Anthem of the Seas that were announced this week, including a notable change to dinner. Royal Caribbean will be discontinuing its Dynamic Dining program on Anthem of the Seas, beginning with sailings on November 27, 2016. The reason for the change is feedback from guests indicated a preference for a dining program that combines traditional seating with the option for flexibility. As a result, Royal Caribbean will offer on Anthem of the Seas My Time Dining program, with traditional and flexible options, as well as introduce new, upgraded dinner menus. The four main restaurants – Chic, Grande, Silk, and American Icon – will now become the main dining venues to support the My Time Dining program and will all feature the same upgraded dinner menu each evening. My Time Dining flexible venues will be located on Deck 4 in American Icon and Silk, while Chic and Grande will be designated as the early and late seating restaurants on Deck 3. The name and décor of each venue will remain unchanged. All Anthem of the Seas sailings departing on-or-after November 27th, 2016, as well as sailings departing November 23rd, 2016 through April 14th, 2017 onboard Ovation of the Seas, will be impacted by this change. In addition, beginning November 27th, 2016, Anthem of the Seas will offer either one or two formal evenings per cruise, dependent upon sailing length. All active bookings on-or-after November 27th, 2016 on Anthem of the Seas will automatically convert to the new dining program, respecting all pre-selected times, party sizes and other reservation features. 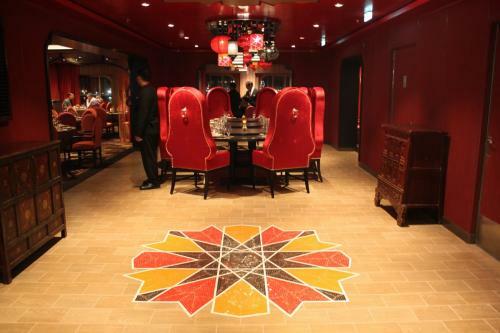 Traditional Dining will occur in The Grand and Chic restaurants and choose between early (6:00pm) and late seating (8:30pm). Traditional dining includes a fixed dining time, fixed venue, fixed table assignment and same table companions each evening. 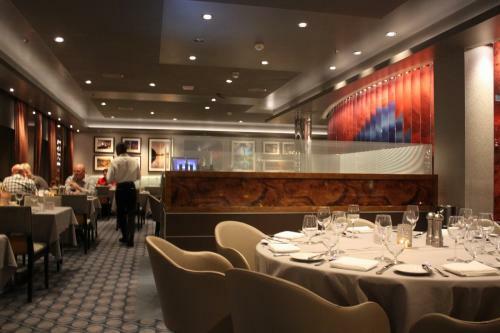 Flexible Dining will occur in the Silk and American Icon Grill restaurants. Guests in Flexible Dining choose a preferred dining time and are seated on a first come, first served basis and include a variable dining time with fixed venue and flexible table assignments. Families with small children can take advantage of My Family Time dining benefits while sailing onboard Anthem of the Seas. This is available as part of the traditional dining experience during the early seating time and can be reserved pre-cruise via Cruise Planner or once onboard. My Family Time dining allows children ages 3-to-11 to enjoy their meal within 40 minutes of seating before heading to the evening’s Adventure Ocean activities. New, upgraded dinner menus will be introduced each evening in all four main dining restaurants. The decision to change how guests dine on Anthem of the Seas marks a tremendous reversal in fortunes for the Dynamic Dining program, which at one time was arguably heralded as the future of cruise ship dining. Back in March 2014, Royal Caribbean had previously announced its Quantum-class cruise ships would usher in a radically new dining program called Dynamic Dining, where there would be no main dining room and instead would offer a combination of complimentary and specialty restaurants for guests to choose from. Then in August 2014, Royal Caribbean announced Dynamic Dining would spread to Oasis of the Seas and Allure of the Seas. Guest feedback changed Royal Caribbean's plans, and Dynamic Dining was postponed indefinitely for the Oasis-class ships and a more traditional Dynamic Dining option was added.